In this edition we welcome Ms. Chikako Mizuhara, CEO of Ginza Seigetsudo Building. Our first stop was Owl Café Mohumohu Ginza. Mizuhara-san introduced the café as the most intriguing store in Ginza. Mizuhara-san loves animals and has had pet cats and dogs since she was a child. The store is located in an area with tall buildings, on a street running parallel to Ginza Chuo Dori, on its Yurukacho side. As we entered the store, owls flew over to welcome us. How exciting! Eleven owls were more than I had imagined. I almost wondered whether there weren’t some stuffed animals among real ones. That day, there were eleven owls and it was almost as if there were some stuffed owls among real ones. The owls at the store have been in human care since they were owlets. Having been brought up with love, they are especially used to being around humans and are very friendly even to people new to them, so it feels peaceful just to be around them. Skilled staff will put them on your head and shoulders, let you watch them fly around, and take pictures and movies for you. The owls had no collar and looked carefree. Owl Café receives a broad range of customers, from families with small children to elderly people and foreigners. At Owl Café, you can enjoy an entirely new experience, not to be gained from shopping or sightseeing, in the center of Tokyo. 1 hour per booking / Bookings from the website are treated with priority. One of Ginza’s few parks, Sukiyabashi Park has many benches that invite visitors to come away from the hustle and bustle of the city. The coffee shop across the street offers takeout coffee, and GInfo, Ginza’s tourist information center, is also located along the same street. Therefore, the park is the perfect spot for tourists to sit down to look at pamphlets or to relax over a cup of coffee. It was a sunny day and I almost forgot that I was in Ginza, surrounded by beautiful greenery in the compact park. It was a most refreshing and relaxing oasis. 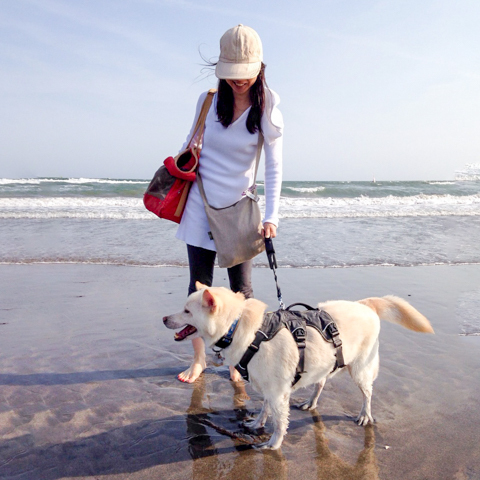 Sukiyabashi Park would be a wonderful spot to include in oyur pet walking route or to take a short break. Aux Bacchanales Ginza is located on Miyuki-dori in Ginza 6-chome. With outdoor seating, the restaurant carries the atmosphere of a café in Paris. The gastronomy and liveliness of cafes that are a part of the Parisian’s day has been reproduced in the interior design of the café, featuring a blackboard with the menu handwritten on it and movie posters. The cutlery and food served, as well as the service are all French style, letting people sitting in the cafe slip away from Tokyo and experience the daily life of a Parisian. Pets are also welcome on the terrace. The café is open from 9 o’ clock on weekend and holiday mornings, so it could be the perfect spot to include in your morning walks with your pet. They even offer water for pets. Given few restaurants that allow pets in Ginza, it is heartwarming to know that there is such a pet-friendly place. As we visited the café in the early afternoon, a variety of tarts were lined up in the showcase. They were all very tempting and I had a difficult time making a choice. I would suggest sitting on the terrace of Aux Bacchanales Ginza to indulge yourself in a relaxed seasonal moment in the heart of Ginza.